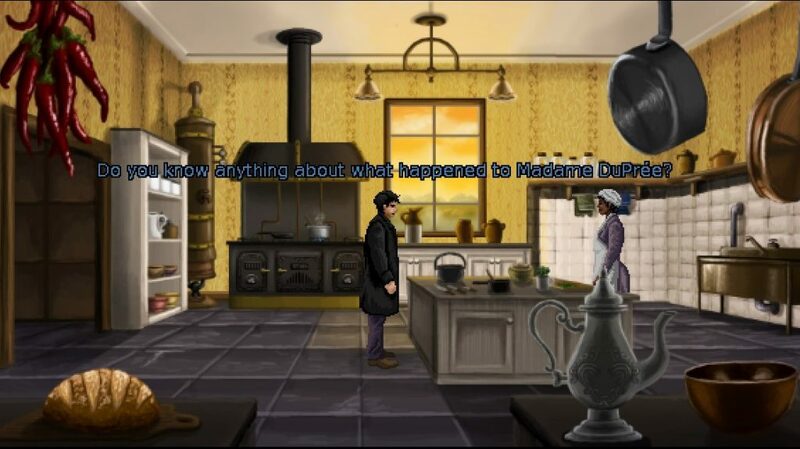 Lamplight City ($14.99 on Steam), the new, retro-pixelated detective adventure from Grundislav Games, and Application Systems, puts you in the well-worn shoes of a hardened Victorian private investigator, Miles Fordham. 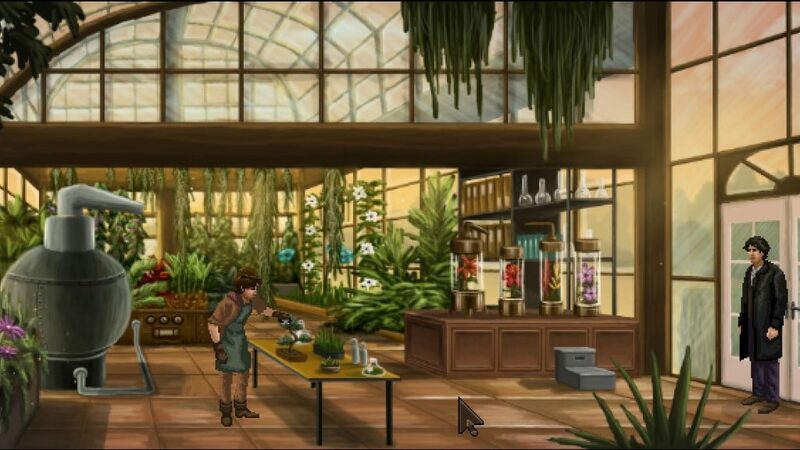 Guilt-ridden over the death of your partner, Bill, and disgraced after being fired from the police, you must endeavor to find the criminal responsible for your losses, while simultaneously solving a string of seemingly random crimes. Can you piece together the clues, and discover how everything ties together, avenging Bill and redeeming yourself in the process? You’ve gotta play to find out. 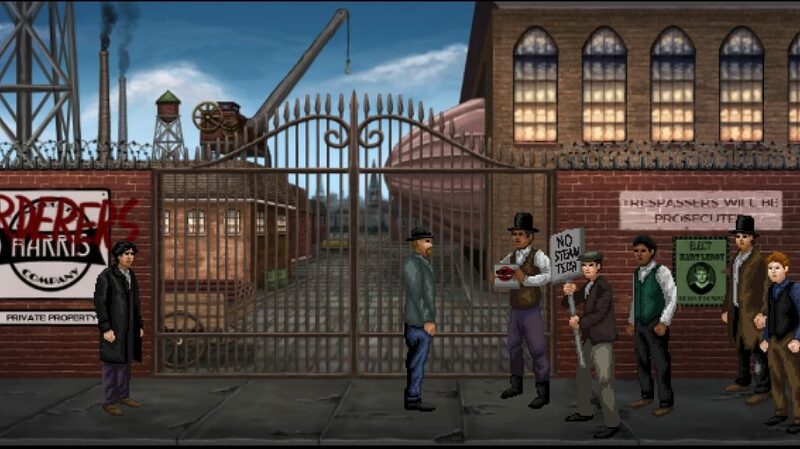 The game is set in a faux Victorian, steampunk-ish reality, where steam technology is slowly taking over, and zeppelins lumber through the skies. In your pursuit of truth and justice, you’ll come face to face with both the poor, gritty underbelly of the city, and the privileged, shiny layer of the upper crust. Theft, kidnapping, murder, and other mayhem abound, as you try to figure out what, if anything, the crimes you encounter have to do with the tragedy of your partner’s demise. Don’t worry, you won’t be completely alone in this mission. The brash, but kind-hearted clerk in your old police station, Constance Upton, filters cases your way, to keep your investigative instincts sharp, and can give you helpful hints if you find yourself stuck. She will also be the person you report your findings to, so the actual cops can go arrest the criminals. On occasion, your wife, Addy, can assist you in getting past a sticky situation, with her skills at distraction, and a surprising working knowledge of steam tech. Your most constant companion, though, is the ghost of your old partner, Bill. He’s always there to give advice, make observations about people, the environment, or items of interest. He may also be a figment of your guilty conscience, but he’s company nonetheless. Gameplay is super easy, with only single mouse-click controls, so you never have to remember which keys do different actions. Your mouse cursor will change its icon depending on what you can do with an item or person. Look at everything that gives you an Eye icon. Even if the information is ultimately unhelpful, you get to hear Bill’s colorful commentary on it all. Make sure to talk to everyone as well, multiple times. 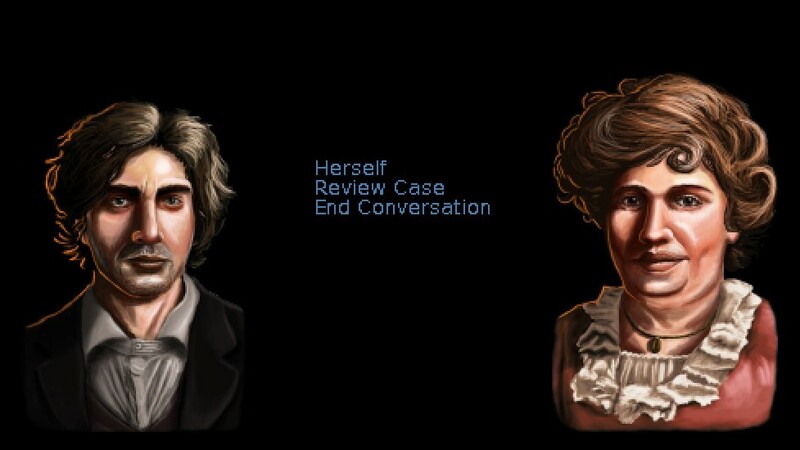 You can choose the order in which a dialogue happens, and can mold the outcome in subtle ways, but you don’t get too many alternate options as to the ultimate direction of a conversation. Some choices do matter though, so think before you click. The voice acting is pretty good, with around 50 different, interesting characters. Dialogue will unlock new locations to visit, and you’ll often need to re-visit them again and again, as new clues come to light. Travelling is easy, with a large, handy map, that will allow you to simply click on a location and instantly go there. Your clues, suspects, and case tasks can be referenced in your Case Notes, so you won’t need to try and remember everything you’ve discovered. There’s no Inventory to worry about, with all of your useful items being accessed through dialogue or an interaction icon. 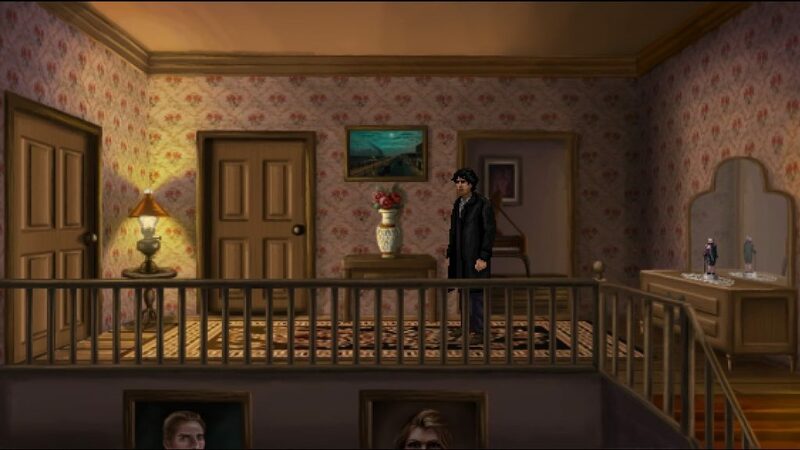 There are 5 cases to solve, each appearing unconnected to the others, but you never lose the sense that there’s a common thread weaving through the background of them all. Each case was compelling, and held my interest for hours. I haven’t finished the game yet, but I’m looking forward to solving all the crimes, and hopefully getting revenge on the criminal who cost Bill his life, and started Miles down his current path as a private investigator. The price is right for the length of the game, the retro feel of the graphics lends a good deal of charm to it, and the cases you’re presented with offer enough of a challenge to keep you engaged, without being too difficult for casual gamers. 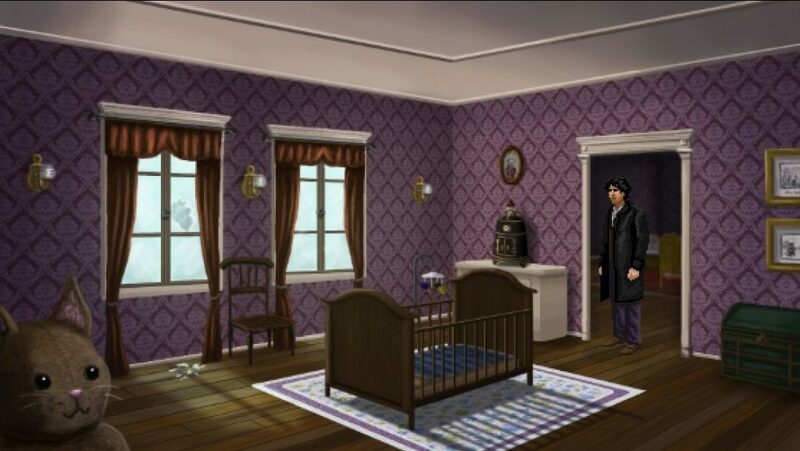 This game should appeal to all lovers of mystery, crime solving, and classic adventure games. 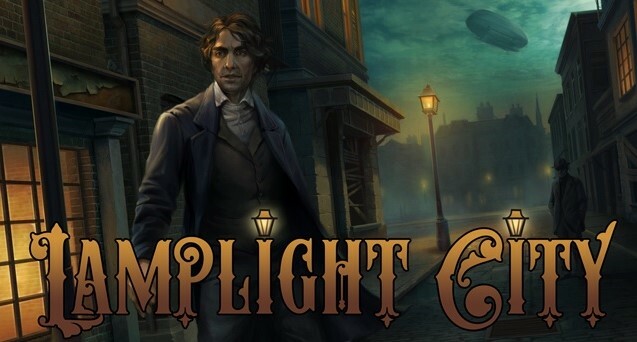 Check it out for yourself on the Grundislav Games‘ official site for Lamplight City, or go straight to Steam to buy it.